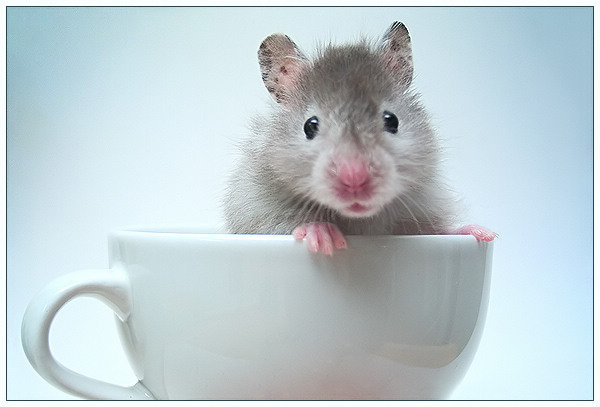 My cute little hamster posing in a white mug for me. Some brightness/contrast adjustment, sharpened x2, big of burning, neat image. Ahh... little sweet guy :). Like your light and soft colors... just wonder why there is pink reflection at bottom of cup. What a sweet little picture. I wish his nose was a little more in focus, but it's not THAT distracting. Nice job! Very cute and beautiful photo. Suggestion: deeper DOF to make the nose and mouth in focus. Even the eyes aren't the shapest - which they should be. The ears in this case are sharp. Nice soft background and reflections-free glass - well done. Adorable. I like the soft lighting and colors. Cute idea for the 'pose'. lol The focus appears to be on the ears - I would have liked the eyes, nose, and whiskers to be in focus...or just use a deeper dof to keep it all sharp. Still a very cute shot and well thought out. I gave you an 8. I'll have a little mouse in my latte please... How did he stay? Great shot. I think it is cheating to use such a lovely heart warming subject. Bumping up on. Best little model I have seen. Give him a little stroke on the head for me. Bumping up. Sweet, seen something similar before, but that mouse was comming out of an egg. Hi! Whatsup? Nice stock photo. so cute! awww! i love everything about this - the simplicity of the cup, the marvellous background, the little chap in the cup. the depth of field appears a little too precise, with the little nosey wosey (sorry, can't help it) being a tad out of focus. but that aside, this is a great image - very poster friendly and one of my favourites so far encountered. 9. Focus seems to be on the ears and the paws, I think it should have been on the eyes and nose. OK, this is wonderful. I love it. I love the little pink feet/hands on the cup, I love the look on his face as though he was caught where he wasn't supposed to be. The crop is perfect, your choice of background and cup are perfect - the blue of the background really sets of the little pink nose and feet. Maybe it's a hamster? I don't know my rodents very well. Anyway. I love this one. Absolutely adorable! My only pick... is that it looks like you lose a bit of focus going up the ridge of the nose... otherwise - terrific. Totally cute, very well lit, and fabulous use of subtle color contrast. If only the DOF were deep enough to include the snout. Nose looks out of focus. Very cute though. Would have been perfect if the pink nose was better in focus. Cute shot. I love this little guy!!!!!!!!!!!! Thank you for entering it. Beautiful and classic studio shot. and the frame is ok. 8. Just too adorable. I hope this isn't the model that died, he's so sweet, and what a good model too! Love the concept, and the shot is great. Oh, that's got to be one of the best. How absolutely adorable! Proudly hosted by Sargasso Networks. Current Server Time: 04/19/2019 11:38:15 PM EDT.